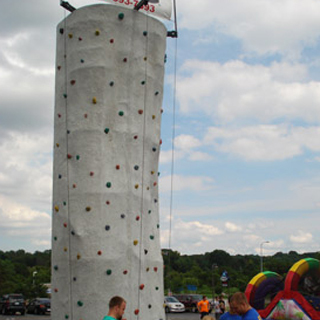 Get strapped in and ready to go for it with our Rock Wall! Climb up the wall using hand and foot holds until you can ring the buzzer! Climbers are able to choose between 3 levels of difficulty! Will you be able to reach the 24-foot summit? Ascenders enjoy a safe way to release their energy before gliding back down to the ground by their harness! Fun to climb and fun to swing back to earth! A must for the outdoor partygoers!